Ultra Wide 160mm Applicator Included. First click here to activate designer. Then add text below and complete each step. Premium Font Preview is not Available. and its not light nor dark. Popular clolurs include Silver, Black, White, Navy Blue and Red. Is Boat Name Preview Above Visible? If it is'nt click here to refresh designer. Shadow/Outline Display is for preview only. Stickers are provided as vinyl cut on 1 sheet. This means when applied to your boat you can feel the letters/numbers. Ordering an outline or shadow you need to first apply the letters/numbers sheet first then the outline/shadow effect. 2 or more boat names. Prices are automatically updated when added into the shopping cart. Please Note: These vinyl stickers are not sold in pairs. If you need 2 please choose 2 as QTY. 1. 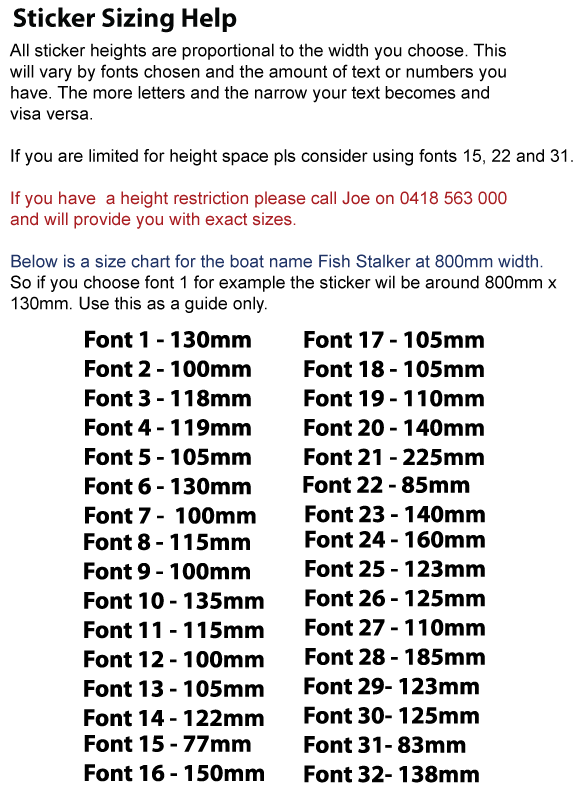 We offer our boat name stickers by the width not the height which gives the customer a few advantages. This includes: You know exactly how long your stickers will be with no hidden surprises when ordering stickers by the height elsewhere discovering that your stickers are not long enough. This option we think offers you more value for your money. 2.Our boat name stickers are not printed. We also provide you with a choice of 2 materials which have the colour you choose throughout the material unlike printed stickers that have the colour printed on the surface that will not last as long when comparing these to the polymeric or 3M colour range. Here is our list of funny boat names you might like. Maybe you might decide to do a boat renaming ceremony as well. 1. We strongly suggest that all stickers ordered need to be applied within a 2-3 week period. 2. Please make sure you pre plan in ordering your stickers if you need them by a set period or for a special event. and you have time to sort things out. buff part of your sticker unless laminated. Polymeric vinyl is the 2nd best material choice followed by our cast option. 8 years longer for the 3M Cast made stickers. they don't bubble when these are rolled and posted out to you in a postage mailing tube. I would like to order the boat name Fish Stalker. The size I need is 800mm in width. What would the height of my stickers be? This really depends on the font you choose and how many characters your boat name has. Below is a a guide chart only. If your limited for space or need an exact size pls give us a call. Fonts 15, 22 and 31 are the smallest in height fonts available. What do we get when we purchase our stickers from you? that have a clear or coloured back ground. Do your sell stickers that have a waterproof backing sheet? Yes we do and you will need to use the Cast option by 3M. hard to stick panels found in caravans? to the back of the stickers and place the sticker onto the surface and move and position your stickers in place. You have about 1 minute to prop the stickers into position. Avoid using this method in very cold weather. You will need to wait about 24 hours before removing the clear application tape. Oops I buggered up a letter. Can you help me? Yes and in most cases we won't charge you. Outcast, Real Deal, Shark Bait, Why Not. mentioned on this web page. Thank you for visiting our boat stickers website.